Downloaded the OST after watching the movie. The Smiths is LOVE! This is a story of boy meets girl. The boy, Tom Hansen of Margate, New Jersey, grew up believing that he'd never truly be happy until the day he met the one. This belief stemmed from early exposure to sad British pop music and a total mis-reading of the movie 'The Graduate'. The girl, Summer Finn of Shinnecock, Michigan, did not share this belief. Since the disintegration of her parent's marriage she'd only love two things. The first was her long dark hair. The second was how easily she could cut it off and not feel a thing. Tom meets Summer on January 8th. He knows almost immediately she is who he has been searching for. 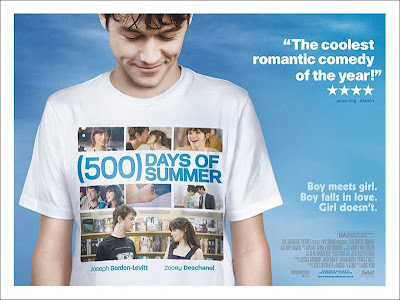 This is a story of boy meets girl, but you should know upfront, this is not a love story. Indeed. The reverberating moral of the story (at least for me): You can get over someone, no matter how painful, how hard and how long it could be. You will, eventually. Someday, the pain will just be a faint memory from the past and it will not hurt anymore each time you think about it. "Who doesn’t like Ringo Starr?"